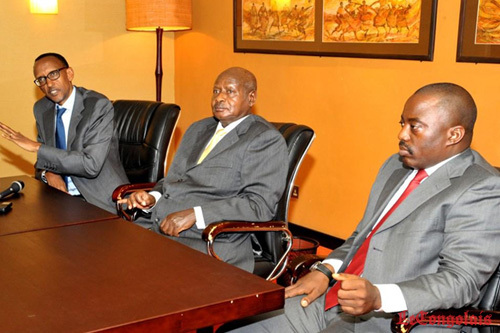 BURUNDI/ KAMPALA/KIGALI – A parliamentary forum of the International Conference on the Great Lakes Region (FP-ICGLR) has recommended that the leaders of Uganda, Burundi and Rwanda urgently meet to resolve their differences. Following a session in Kampala, the Peace and Security Committee of the Forum of Parliaments of ICGLR member states, want Rwanda to meet Burundi to iron out their issues, and also meet Uganda to settle their current conflict. “The committee has resolved that the Heads of States should work amicably and diplomatically towards resolving these issues for the mutual benefit of this region,” says a communique adopted March 27. The ICGLR was established in 2008 comprising 12 countries including Rwanda and all its neighbours from East, Central and Southern Africa regions. The unending conflict in DR Congo, in which all regional states were involved, was the catalyst. Apart from the Heads of States who regularly meet, the Parliaments of the member states also formed a single platform to use their clout for regional peace and security. Before the current Rwanda-Uganda standoff, Burundi already had its own issues with Rwanda since 2015. Burundi has literary closed its border as no Rwandans can travel there. It has also banned all Burundian exports to Rwanda. Burundi accuses Rwanda of involvement in a coup that nearly toppled President Pierre Nkurunziza. Since 2015, he has not travelled out of Burundi – instead sending his vice presidents for foreign engagements. As for Uganda, Kigali has put across what it calls “three outstanding issues”: support to individuals and groups bent on fighting the government; arresting, torturing and deporting Rwandans, as well as economic sabotage. As a measure, a “travel advisory” is in place barring Rwandans from going to Uganda. No persons with Rwandan travel documents can cross border to Uganda. Kigali has vowed that until its concerns are handled, no Rwandan will go to Uganda – saying it cannot guarantee their safety while there. Former Ugandan MP Amb. Onyango Kakoba, the Secretary General of FP-ICGLR, told journalists that the resolutions adopted will be submitted to the foreign ministries of Rwanda, Uganda and Burundi – and will also be followed up to ensure there is action. The resolution of this body are however non-binding as the leaders being targeted have no obligation to listen to the parliamentary forum.